Walkways require quality and durable materials. Concrete pavers are a go-to choice for their unparalleled, long-lasting surface textures, sturdiness, and beauty. As your stone supply provider, we provide you with access to the top pavers for any walkway you build in State College, PA.
A retaining wall can sometimes be simply a functional and necessary way to remedy a steep slope in your client’s landscape, but other times it can serve to add some much needed dimension and interest. While natural stones are quite beautiful, they can also add cost to a project because they are heavier to transport and require a lengthier construction time. Unilock wall units have all of the charm and appeal of natural stones, but they can significantly shorten the installation time for a York, PA, retaining wall project. Total Landscape Care recently acknowledged the landscape design and construction expertise of Hummel’s Landscape Inc., as well as the exceptional quality of materials supplied by Watson Supply Inc.
What Kinds of Pavers Are Suited to High-Traffic Areas in York? Designing structures that meet the requirements of high levels of traffic can be a challenge for every York, PA, contractor. The first step to a successful project is being confident that the materials you are working with are worth the cost, time, and effort. Creating a patio with modern flair can set a hardscape apart from those of surrounding Harrisburg, PA, neighbors. A modern patio relies as much on the pavers underfoot as it does on lighting and furniture selections. Contemporary designs tend to be sleek, clean, and well put-together. Here are a few Unilock pavers that fit this criteria and pair spectacularly with modern designs. Certain hardscape features, like fireplaces and fire pits, enable you to continue using your State College, PA, outdoor kitchen or patio despite the biting cold of the fall or early winter. In addition to providing necessary warmth, these fire features stand out as the focal points of their respective outdoor rooms and simply magnetize people towards them with their soft lighting and inviting ambiance. Seating walls can be a life-saver in small backyards, where moveable furniture arrangements tend to take up too much space. They also come in handy when your Lancaster, PA, hardscape suddenly has to accommodate a large family reunion or a surplus of guests. Watson Supply was recently honored to be named Unilock's "Dealer of the Year" for 2017. Tim Watson (Owner) and Ron Juchem (Hardscape Manager) were presented this award at Unilock's Awards of Excellence Banquet that was held on November 17 in White Plains, New York. The hardscapes of your home would be incomplete without gorgeous pavers for the “floor” of the structure. 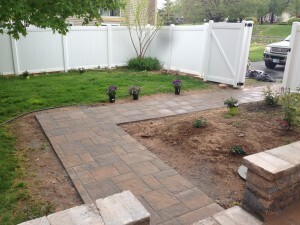 In Harrisburg, PA, finding suitable pavers is as easy as consulting the Unilock catalogue. The company offers easy to install, durable, and affordable options that will appeal to the homeowner’s eye for beauty and the contractor’s interest in quality and unity. Having a high quality and reliable stone supplier is an important asset in any Harrisburg, PA, contractor’s arsenal. Having the right quality of materials for your project is almost as important as the experience of the contractor. With the right supplier, you can be assured of the durability of your project and the satisfaction of your client. Choosing the right materials is without doubt the most important aspect of designing and installing a landscaping project for your Harrisburg, PA, clients. Trusted brands, in addition to inspiring confidence with clients, also happen to provide materials with top fit and finish that can make your project really stand out.